A fresh approach to fresh food! Every year at the hubby’s school they do a fund raiser, and he gets a case of these babies straight from the grower–the Cox family. 40 perfectly round, fuzzy, juicy, sweet orbs of love. Yum. The western slope of the Rocky Mountains apparently has the perfect conditions for growing peaches—hot and sunny during the day, but nice and cool at night. BTW—this is also the perfect venue for growing certain types of grapes, and there are some fantastic vineyards out on the Western slope–go wine tasting. Do it now. 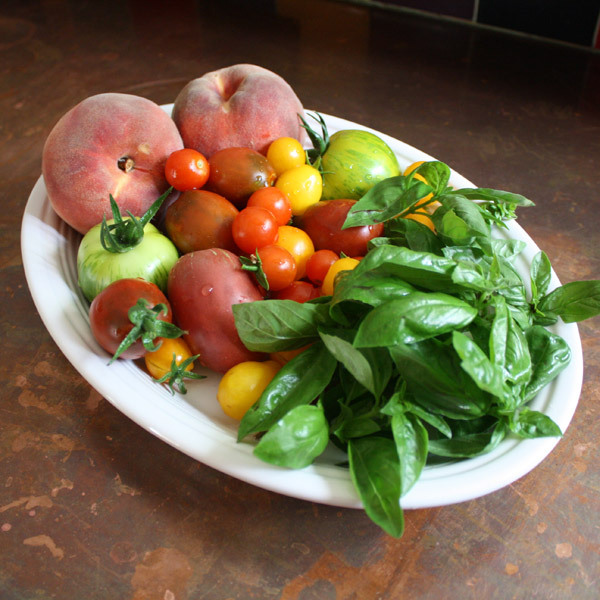 At the exact moment the tomatoes in the garden began to ripen, Palisade peaches arrived, and thus the Magic Salad, as the hubby calls it, was born. 1 medium to large peach, chopped into ½ inch pieces. If you can get a Palisade peach for this, do it! If you sadly live in a different part of the country, do your best to get a locally grown peach in season. 1 – 1½ cups of tomatoes, chopped ½ inch pieces. You can use any kind of salad tomatoes—I usually use a mix of different colors and sizes, just to add a bit of visual appeal. Drizzle of good balsamic vinegar. We happened to have some excellent aged balsamic flavored with black cherry from Seasons Taproom in Bethlehem, PA.
Arugula – 1 to 2 ounces, or enough to make a bed for each salad. From the garden, of course! Good feta cheese, crumbled – about 4 ounces. If you live in Denver, get the Greek feta at Pete’s Market on Holly & Cedar. They have four varieties there—Greek, Domestic, Bulgarian, and French. They are all good, but I prefer the Greek for a crumbly texture and Bulgarian for a more creamy texture. Greek is good for this salad, because it crumbles nicely, and it’s a little sharper and saltier—counterbalances the sweetness of the peaches and tomatoes nicely. Basil chiffonade, about 2 tablespoons. Chiffonade is a really pretty French word that means “made of rags”. How does everything sound prettier in French? Put the peach and tomatoes in a medium bowl. Drizzle with just enough balsamic vinegar to coat. Toss. Season with salt and pepper. Toss. Drizzle with olive oil to coat. Toss. If you have other stuff to work on, this can sit, refrigerated, for about ½ hour. Just stir it up every ten minutes or so. Lay a bed of arugula in four wide bowls. 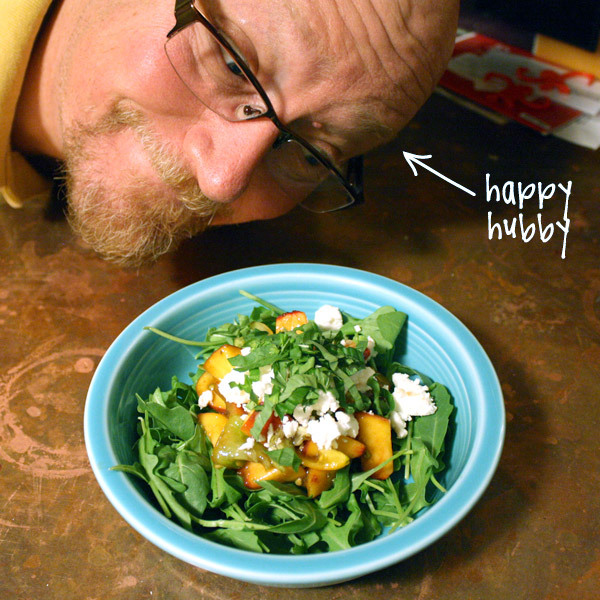 Spoon the peach/tomato mixture over arugula. Top with feta, then basil. Rare Agricultural Sighting Takes Gardeners Around the Globe by Storm!